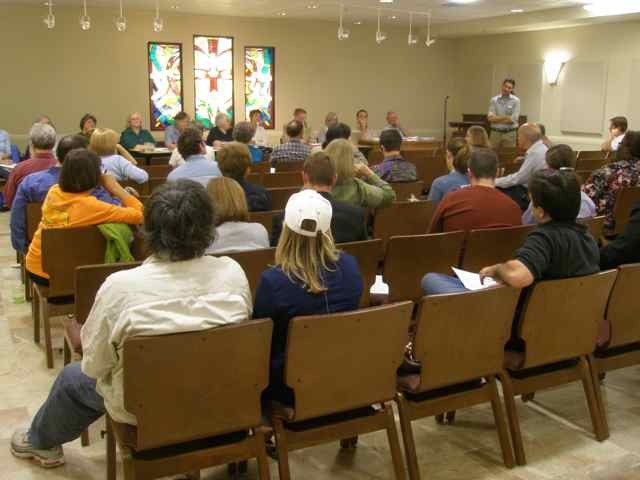 The regular General Membership meeting of the Allandale Neighborhood Association (ANA) was held on Thursday, September 24, 2009, at 6:30 pm at Covenant Presbyterian Church, the President being in the chair and the Secretary being present*. The minutes of the previous General Membership meeting (26 March 2009) were read and approved. *Members Present: Allan McMurtry, President; Joe Reynolds, Treasurer; Mary Jean Matus, Secretary; Donna Beth McCormick, Vice President; Paulette Kern; Peggy Maceo; Dan Diener, Diane Swinney; Laura DiCarlo; Mat Thompson; George Roman; Cynthia Keohane. Fred Clement, Director of Administration Covenant Presbyterian, welcomed the ANA to Covenant Presbyterian, and invited anyone interested to a tour of their new facility after the meeting. Current Balance$16,281.06Business$7,747.60Savings$6,534.00CD (12-17 mos)$2,000.00Net inflows/outflows 1/1/09 – 9/23/09: $ – 1,467.16. Joe presented a draft annual budget to be presented to the Executive Committee (EC) at the next EC meeting for their consideration/approval. Peggy Maceo (ANA EC member and Urban Forestry Board member) introduced Michael Embesi, City Arborist. Michael began by defining the purpose of the City of Austin Tree Ordinance: to promote, protect, and replenish the urban forest. Enforcement of the city’s tree ordinance is a key function. Planning efforts include data accumulation such as measuring canopies and identifying neighborhoods with declining canopies. The urban forest is important for aesthetic reasons, but is also important in that trees increase property values and add ecological value by cleaning our air and purifying rain water. Recommended time for tree maintenance is in the fall and spring. Fall is the best season for planting new trees. Pruning usually done for human impact. Older trees should not be pruned except to remove dead limbs. Young trees, after a couple years growth, can be pruned to train growth. Arizona ash trees, a popular tree frequently planted decades ago in our area, are now at the end of their life spans. As a result, recent tree loss is high, and Austin is facing an increasingly stark landscape. Michael encouraged everyone to evaluate their yards for planting new trees. Plant trees where you have the room, and be proactive by planting trees when tree removal due to disease/advanced age is imminent. Estimates for Austin’s canopy overall is about 30%. For reference, Barton Hills has a canopy of approximately 45% and Mueller only about 2%-5%. A Q&A session followed. Aside from some specific how-to questions from the audience, some questions and concerns were expressed relating to conflicts between the City’s tree preservation/replenishment goals versus limits imposed by right-of-ways controlled by Austin Energy, Austin Parks and Recreation, and the City’s plan for increased density. Concerns were also expressed relating to a perceived disregard of City regulations for tree removal by homeowners and/or developers, and the effectiveness (or possible lack thereof) of the City’s enforcement of the tree ordinance. Michael informed everyone that recent proposed changes to the Land Development Code relating to enhanced tree protection are still pending City Council action. (The draft version of these proposed changes can be seen here: Ordinance Amending LDC Sections 6-3-48 and 25-8(B)(1) relating to tree protection). (Also see main website http://www.ci.austin.tx.us/trees/). Reference books were provided with information on native landscape choices for our area. Allan first thanked George Roman, Bylaw Committee chair, and committee members Kay Newell, Joe Reynolds, Duncan Fox, Peggy Maceo, and Cynthia Keohane for their hard work reviewing the ANA bylaws and incorporating changes in order to be compliant with State law. Allan also noted the time invested by EC members reviewing the committee’s proposals. A copy of the proposed revisions to the bylaws has been posted on the ANA website (www.allandalereporter.org). Hard copies were distributed to all members present. Joe reviewed key changes. Joe and George noted that the bylaws will still require review by an attorney to assure compliance with State law due to their complexity and legal nature of the language. In addition, the bylaws still need to be reconciled with the Articles of Incorporation. Donna Beth McCormick motioned that the ANA adopt the bylaws. George Roman seconded the motion, and the motion passed unanimously. October 6 is National Night Out (1st Tues of every Oct). There are currently 24 parties planned; it’s not too late to plan a party though the deadline to register (and have a visit from EMS, Fire, or Police) is passed. Laura’s goal as committee chair is to have 1 block captain for every 10 houses. She also noted that the ANA now has an electric engraver available to anyone who would like to etch ID information on personal property. Contact Laura for more information. Important announcement: October 6 is the next scheduled hearing before the City of Austin Zoning/Plating commission. There are currently 5 cases scheduled to be heard pertaining to the Allandale area. Anyone with a concern and/or with standing for any proposed subdivision of existing lots in Allandale should try to attend. A map was provided pinpointing re-subdivisions and VMU overlays in the neighborhood. Deed restrictions in some areas of Allandale prohibit or limit subdivision of existing lots. However, the City will not uphold deed restrictions in the decision-making process. The ANA continues to explore other possible tools to curb further subdivision of existing lots in the neighborhood. Paulette encouraged everyone to look for notices from City relating to any proposed new developments as they are required to give notice to any property owner within 500 feet, and be sure to respond to the respective case worker with concerns. Contact Paulette, go to hearings at City Hall, and have your voice heard. Numbers count. Look for more information in the next newsletter. The ANA Zoning committee is being re-organized – an organizational chart was provided. There will be a meeting at Hangtown Grill on Tues Sep 29, 6:30. Anyone is welcome to come to learn more about the committee’s work, its members, and to volunteer if interested. Neighborhood resident Malcolm St. Romain announced the next clean-up effort at Northwest Park is Sunday Oct 4, 9 am -12 pm. They will be cleaning up the pond; thinning out the cattails, and picking up trash. Please volunteer! Continue to check the newsletter/website for notices of beautification activities. Linnea gave a recap of this year’s accomplishments. This past year, the Beautification committee organized 2 major tree plantings. One was within the street medians on Northcross Drive. The city is contractually obligated to water the trees – a much-needed service. The second planting was at Northwest Park where 50 trees were planted by volunteers. This was made possible because of Allandale property owners who participated in the Native Habitat contest – winning 2nd place! Linnea thanked everyone who helped make this possible. The next newsletter is scheduled for October. Tom has been working on a re-design of the ANA website (www.allandalereporter.org). The new design is “blog-style” enabling information to not only go out, but to come in as well, as readers can post comments, etc. The goal is to further enhance communication within the neighborhood, and to help provide EC members with more insight of neighbors concerns and/or pleasures. Check it out and let Tom know what you think. The ANC comprises 90 neighborhoods. Cynthia holds the position of North Central Sector representative. Cynthia holds informative monthly meetings at Hangtown Grill, every 3rd Saturday of the month (11:30 am – 1 pm). She stressed that the ANC is an invaluable resource that the ANA should take full advantage of, particularly with issues relating to city policies and procedures. Dan, as recently appointed Chair of the membership committee, will be assuming some of the responsibilities historically belonging to the Treasurer. Dan will be coordinating efforts with the Treasurer in maintaining a membership database that will hopefully be more readily available to other committees for contact/volunteer information. Dan noted that we currently have approximately 340 members out of approximately 3100 households. His goal as committee chair is have a membership campaign for the upcoming year as we need to significantly increase our membership base in order to be a more effective neighborhood association. A comment was made suggesting that block parties be considered as a venue for membership drives. Anne Young moved to send $50 thank you gift to Covenant Presbyterian. George Roman seconded the motion and it passed unanimously. Anne Young made a motion to accept the slate of nominees. Jackie O’Keefe seconded the motion and it passed unanimously. George Roman moved to adjourn the meeting. Laura DiCarlo seconded the motion and it passed unanimously.